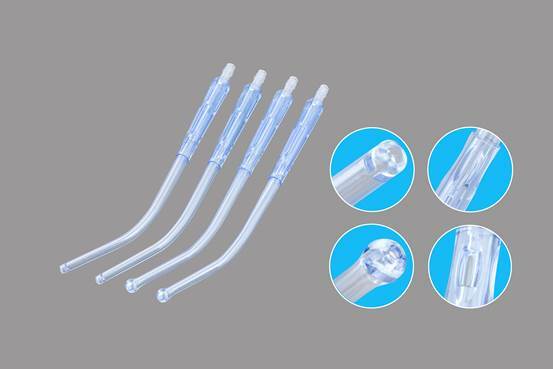 Yankauer Suction Tip and Handle are available in four types, rose tip with vent, rose tip without vent, flat tip with vent and flat tip without vent. Made by medical grade resin which meets up to the requirement of Class VI. Suction Yankauers are designed with durability and convenience in mind. They are constructed of a clear, transparent material with a slip-resistant handle,a smooth and uniform inner surface for rapid evacuation, and a ribbed five-in-one connector for easy connection to various sizes of connecting tubing. They are available in various sizes with or without control vent bulb or flange(straight)tip and rigid or flexible design, for continuous or intermittent suction,Tyvek pouch packing. We are among the reputed organizations, deeply engaged in offering an optimum quality range of yankauer suction tip and handle. Offering you the best products and serving all your needs has always been our top goal. Please feel free to contact us if you have any question.